Carlson Design – Bad Plots,what to check; Easy to fix. The plotter is not calibrated. Most of the time, stalls and bad plots can be resolved by lowering your speed and acceleration. Start with an overly-conservative value for acceleration, speed, and minimum speed, and gradually increase increase the values until you can reproduce the stall. Once you have discovered the lowest value that produces a stall, set your speed/acceleration to 10-20% less than the slowest stall speed. We recommend setting your speed and acceleration in a ratio of 1:2, so if your speed is set to 10, you should set your acceleration to 20. Minimum speed should be in the range 0.1 to 1.0. Please remember, when diagnosing and solving a problem — be scientific — Change only one variable at a time until the problem is resolved. 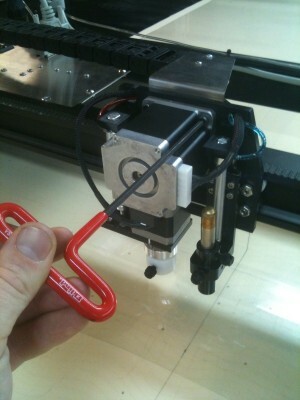 Before trouble shooting, check all cables are securely attached to the plotter/cutter and computer. Kill non-essential programs running on your computer other than Plotmaster. Make sure your LPT print booster is plugged in and turned on. 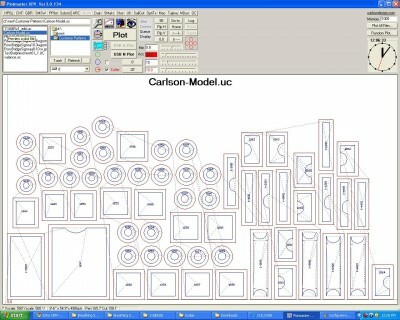 Carlson Design plot/cut files end in a *.uc file extension. Once imported, they can be previewed in plotmaster home screen. PMXP home screen -- preview selected files. In the preview screen, what you see is what you get. Plot lines appear blue and cut lines appear red. Travel lines (pen/cut up) are dashed lines. The size and number of points in a selected file appear in the lower left corner. Visually inspect your file for missing points, jagged corners, unnecessary points, and redundant or overlapping lines. Check your pattern is properly sized. If necessary, you can edit your pattern in PEdit. Scale your plotter: In the configure screen, draw the largest test box possible and measure its X (down table) and Y (across table) size. Tell the computer the size of the measured box when prompted. Redraw box and confirm it is the correct size. Square your plotter: Jog plotter into track stops. Plot a square. Measure the box’s diagonals. If the diagonals are not equal, adjust your track stops by rotating one side left or right. 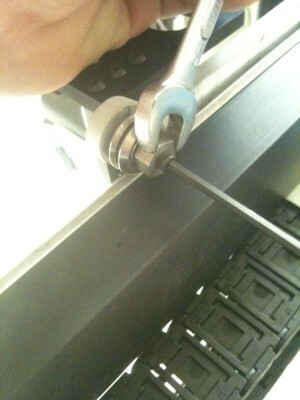 Repeat until machine is square, then tighten track stops securely. 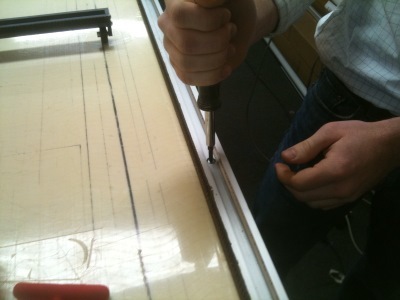 Jog machine into track stops before each cut to ensure system is square. 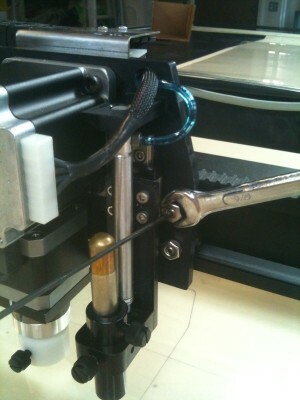 Check Pen/Cutter Offset: In the configure screen, test X/Y offset. “Test” button will plot, then cut a test box. Adjust the value of Xoffset and Yoffset until the plotted box and cut box are directly on top of each other. Values are in inches. Check All Settings: Screen shots of factory settings are included in manual. Check configure settings and PMXP home speed settings for unusual values. Restore defaults if necessary. If you have a good file, calibrated system, and are using your factory set, default speed settings, and your patterns are still not plotting/cutting correctly, then your plotter/cutter is stalling. A stall occurs when your plotter does not receive or cannot process the signal sent during plotting/cutting a file. This is evidenced by the plotter/cutter’s failure to return to its start point or (0,0). To test, turn on “mark origin” in the configure screen. The plotter will mark it’s starting point. After running a plot/cut file, the plotter/cutter’s pen should return to the apex of that mark. If it does not come home to this (0,0) point, then the plotter has stalled. Is your table level? We recommend you level (+/-) .25″. Is your track parallel? Look and listen for noticeable binding during operation. If you have a tight spot in your track, try loosening the nearest screw a half turn. Loosen screw where/if binding occurs. Is the drive wheel loose? If yes, tighten the set screw. Check all drive wheels. Pull motor firmly into the drive belt. While maintaining pressure, tighten. With the plotter turned on, there should be no backlash. Repeat for other x motor. Eliminate Y Motor backlash - Loosen Allen screws (nuts held in slotted pocket on back of head, do not over loosen), push motor so Y Drive wheel firmly engaged with belt. When turned on, there should be no backlash. CTx/STx head adjustment -- Eliminate play front to back by tightening the top eccentric wheels (white wheels). Loosen nut. Rotate Allen until wheel is against rail. Maintaining this Allen position, tighten nut. Do not over tighten wheel against rail. 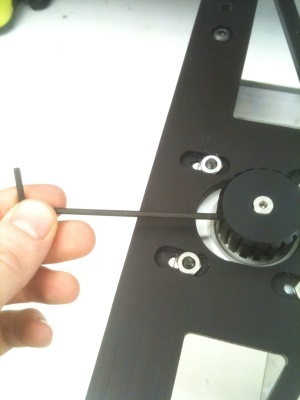 PT Head Adjust -- Eliminate play front to back by adjusting eccentric guide wheel. Loosen Allen screw, rotate nut until firmly engaged with V-guide, tighten Allen. Are your track carriages to tight? They should glide freely at least 12″ when pushed and have some play side-to-side. See the video for instruction on how properly adjust. 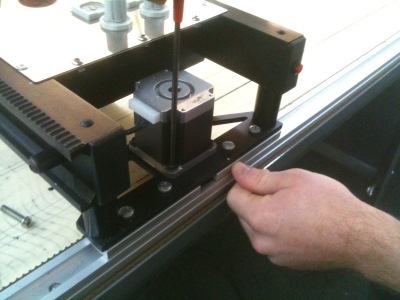 If Stall is only in Z axis (the cutter) – restore factory settings in configure screen and turn off pressure. If this eliminates stall, your pressure is too high. Otherwise, it is a hardware problem — see below. Are your motors to hot to touch? If yes, turn your machine off immediately. Let them cool, does the problem go away? 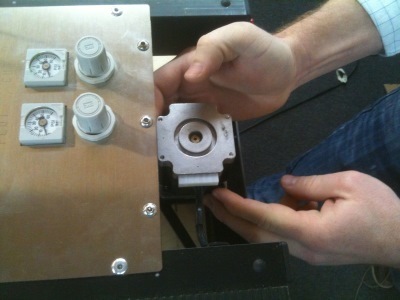 If the motors continue to overheat, you may have a loose current set resistor, please contact Carlson Design. Do your motors have weak holding power? With the plotter turned on, is it easy move any of the motors? If yes, and you have performed all the tests listed above, then you may have a failing motor drive. Please contact Carlson Design for a replacement. Replace the control cable. If crimped or damaged, these can create “ghosted” or intermittent problems. They are affordable and easy to replace. We recommend you keep one on the shelf. Replace the LPT print booster. You can try testing with and without it. Finally, replace your computer if necessary. Windows PC’s and printer ports, while more reliable than ever, have been known to fail. They are affordable and easy to replace. Our systems are very simple. If your file is good, your system calibrated, your table level and track parallel, and you have checked for hardware problems — then you should have very accurate, repeatable plots. If you are still having difficulties, please do not hesitate to contact Carlson Design. One of our tech’s will be happy to help.